Our flagship store Going In Style Travel Accessories at Stanford Shopping Center is still open during construction. Going In Style Travel Accessories at 609 Stanford Shopping Center, Palo Alto, Ca 94304 is open during remodel even though the entrance near the former Ralph Lauren Polo store is closed off. Due to construction, the NE Stanford Mall entrance facing El Camino Real is closed temporarily. If you find yourself at this closed off entrance, don't worry, simply go right and walk towards LaBelle Day Spas & Salons. 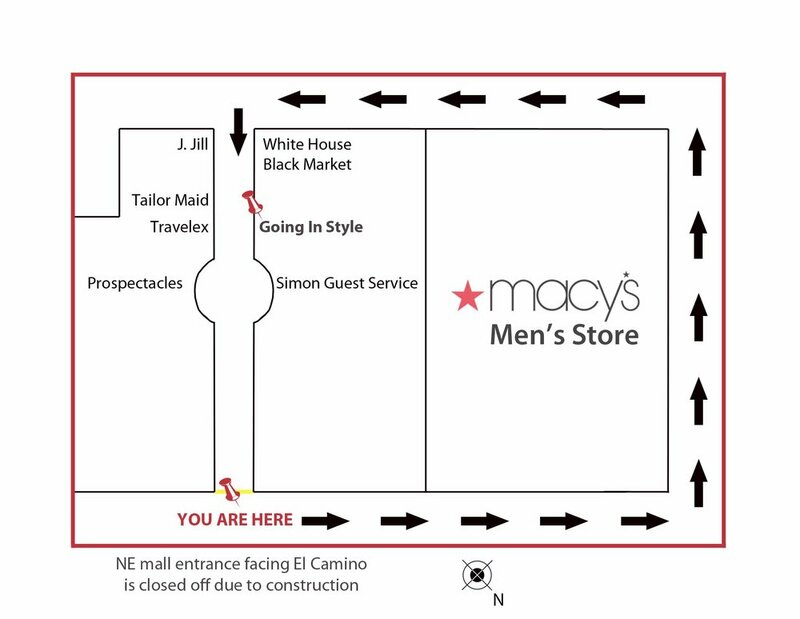 Continue walking past the day spa and walk around Macy's Men's Store until you get to the NW Stanford Mall entrance, also known as Palantine Court, facing Sand Hill Road. Once you get to the Palantine Court Entrance walk pass the Muji Japanese store which will be on your right. You will see White House Black Market clothing store on your left, and once you pass White House Black Market you will take a left towards the Inner Circle. Going In Style Stanford Travel Store will be on your left across from Travelex Currency Services and The Tailor Maid alterations services store (on the second floor). The construction will be done summer 2018 and the entrance will be open again then. We hope to see you soon!